I am still undecided about this book. The main thing I took away from this book was that whoever edited it needed to go farther- this book was entirely too long. I felt like large parts of this book were just giving me the day to day of being in the NYBA. I really wanted to start skim reading (and I love reading about ballet and New York), but I forced myself to read it all. It wasn't that it was boring, but it was that I found myself going "WHERE IS SHE GOING WITH THIS?" I wasn't really a fan of Zeppelin (oh my gosh that name is awful) and Justin. I didn't think either of them were hero material and I thought that while I had glimpses of passion while Justin and Vanessa were dancing- their scenes together were rather dull. I didn't believe that they loved each other or had anything established. Between the two, I liked the interaction between Vanessa and Justin more than Vanessa and Zeppelin. I thought Zeppelin was an incredibly flat character. I am not sure if it is because he has secrets or he really was that .... flat. I found myself not really caring about him. I did enjoy the side characters- TJ, Blaine, Steffie, and even Anna. I thought they were fun and were given more personality than some of the main characters. This was a very action driven book. We don't really learn much history about any of the characters until the very end. The problem with it being action driven- well, other than the dancing, there really WAS no action. I did really enjoy the dancing scenes. The author must have taken dance or have had experience with it to be able to describe the movements so easily. That is really where the book shined- the dance scenes. They were a delight to read. I am still undecided if I like how this book ended up. It was very close to the Black Swan in a lot of ways, but there is a big twist towards the end that takes the book in a new direction. I just don't know what I think about it. I do know that I hope that in the next book, the editor is more heavy handed. A good 100 pages of this book could have been taken out and I think that would have changed my review drastically. All in all it wasn't the worst book I have ever read, it wasn't the best either. 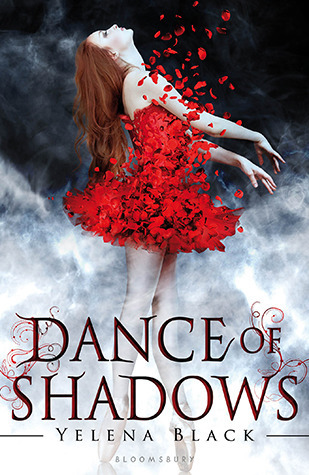 Dance of Shadows will be memorable to me for the dancing, but that is all. PS- I just have to note - this book has the worst case of "Worst Parents of the Year Award" Contenders. 14 girls gone missing and dying, all in the same ballet role and no one notices. HA! Yeah... not so much. Oh and who goes 6 months without talking to their teen daughter- .... oy. I am currently reading a book with some of the same issues. I am liking the characters, but it seems to be dragging a bit. I am 80% done and ready for them to get on with it already LOL It is hard because I like the story and the world, but wish I liked it just a little more :) Thank you for sharing with us. So much yes. I wish the editor would have been a little more heavy handed. Well, it seems the book has the cover going for it. Definitely caught my eye. Though, I tend toward paranormal, vamps and werewolves. I may not be the best audience for it but it may appeal to lovers of dance and details. Isn't the cover gorgeous??? Probably my favorite of 2013 so far! I had a lot of similar issues with this book especially about the editing-a lot more could have been cut out! I do adore the cover though and loved the look at dancing. Me too- I haven't read any books about dancing before- I think I would enjoy it!